Can I use this product will using the Ivomec for heartworms? Yes, you can use this product with Ivomec (Ivermectin) safely. 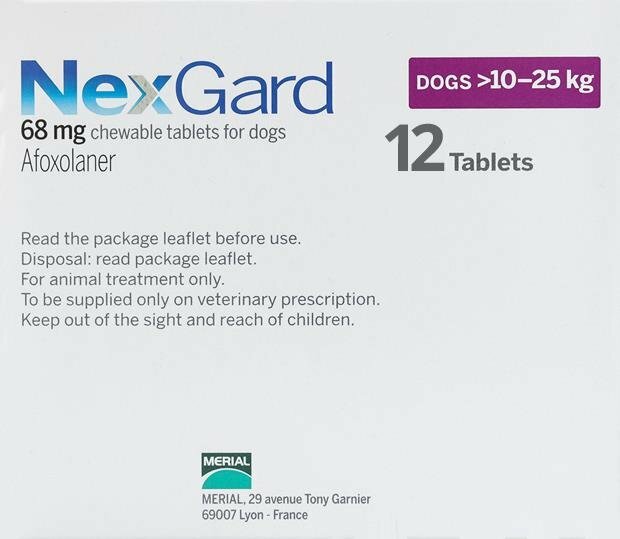 We also recommend Nexgard Spectra which is same as Nexgard with extra heartworm protection. Yes, we can arrange it in the way you need. When you say that you are selling a 12 pack are you selling 12 packages with 6 chewables per pack and each package is good for 6 months? Or is your 12 pack just 2 packages with 6 chewables? I need to know for sure as I got ripped off before because I have had my dogs on Nexgard for over 2 years now and my vet is extremely expensive and I found them on line for a very reasonable price but was shocked that the price they were asking was per chewable and I did not think that those packages could be opened and sold individually, so now I am a bit scared when I find such a great deal. I need to know for sure. Also because I am ordering from Canada do I need to pay duty on this product and what would that be; could you let me know. Thanks for your time and patience. 12 pack contains 12 units which will protect your pet for 12 months. You do not need to pay duty on this product. If I order auto delivery, what happens if the price goes up? Will I be asked if I want to continue? Or be advised in any way.? Have been stung by this option once. Not interested in being stung twice :-). Hi. Our system will not explicitly let you know when the prices change, but you will receive a notification of your order a few days before it is scheduled to ship (and before you are charged), with the product details and prices included. This is to ensure that you have sufficient time to cancel your orders if need be. Also, our prices don't really go up that often - perhaps once every few years, or so. I have two Frenchies between the med guidelines. They weigh 26 lbs each. Will they be safe if I get the flea meds that go to 24 libsl? Hi. It does seem that they fall within the 24-60 lbs bracket, so it should be safe, however, I would recommend that you consult your vet for this particular query, just in case. This is the third time we've ordered Nexgard from Petbucket. It's a great product and it was delivered in a timely manner. First time purchase and was very satisfied with my product would definitely buy from them again such great prices. Order arrived on time. Can't beat the price! Quality products too!